I bought this game when it was in the Christmas sale on Steam, I was drawn to it by Total Biscuits ‘WTF is…’ on this game where he praised how well the Strategy aspect worked with the First Person Shooter aspect. I’ve played this game quite a bit now and I have to say I really do enjoy it most of the time, there are times where I find myself getting frustrated with the game, this mainly happens when you have high ranked players in the game who just place down a bunch of turrets in your spawn zone which causes you to instantly die whenever you respawn but other than that the game is pretty balanced. There are four classes and each class has several different weapons at it’s disposal: You have the Assault class which is your bog-standard class, you have assault rifles, pistols and grenades at your disposal, there is the Exo class which is the heavy class and carries miniguns and is tough as nails, there is the Stealth class where you can brandish knives and light-rifles for quick manoeuvrability and finally you have the Support class which allows you to heal your team mates but also provide suppressing fire with shotguns, pistols and grenades. 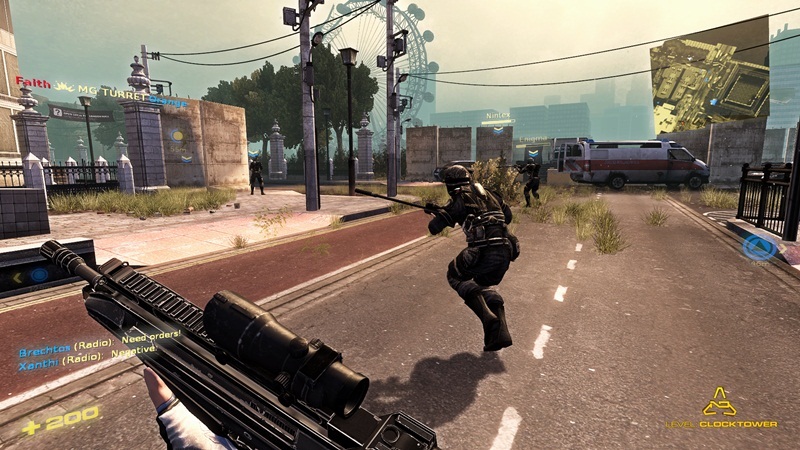 Each class has their own special ability which makes that class unique and certain classes are required to combat these special abilities, for example; if someone is playing as the Stealth class they can go invisible for a short period of time enabling them to infiltrate bases and backstab other players but if you choose the Assault class you can use it’s special ability of Thermal Vision which allows you to seek out invisible Stealth players. The Exo class’ special ability allows the player to become hunkered down to the ground like a turret which increases accuracy. The visuals of this game are pretty good, it’s a pleasant game to look at and to play, there are many hiding spots and intricate places for players to conserve their energy or even wait for their foes. The weapons feel very nice to use and are very well balanced, you really feel the weight of the weapons you’re carrying when moving around. The audio is hit and miss for me, the weapon sounds and environmental sounds are fine but there is an extremely irritating announcer that doesn’t shut the hell up, whenever something happens the announcer tells you that it’s happened in a very annoying and repetitive monotone voice, because this happens pretty much constantly it can really get irritating after long periods of play. Personally I’m not much of an RTS fan and haven’t played as a Commander on this game so I can’t comment on the mechanics and the features of the Commander position so you would have to find that out for yourself. The game offers an extensive tutorial section which is optional to complete, it explains all you need to know about the game and is very well done. Overall I’d definitely recommend this game, it’s a very well crafted game with some great features and some nice combat but the announcer does get irritating, fast and I don’t think you can turn it off.